For one reason or another, I never really owned any of the handheld consoles made by Nintendo until we opted to get a Nintendo 3DS given our relationship at the time. The primary purpose was to be able to play the various Super Mario games that my ex-partner enjoyed in an effort to get him into gaming more. And on the flip side, it was an interesting opportunity to finally try some of the unique games exclusive to the console. 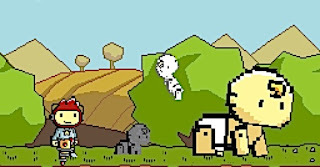 I had long heard about Scribblenauts from various blog posts and stories from friends and was admittedly curious about the game. It seemed pretty formidable that the game allowed you to create a wide variety of creatures, objects and other helpful tools solely through the use of word combinations. And being the geek that I am, I was pretty excited about testing its language library and seeing just what kind of crazy things I might be able to create in order to solve the various puzzles. 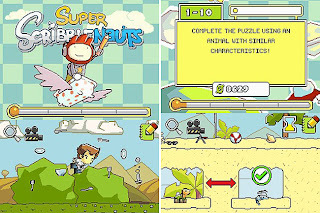 Super Scribblenauts is the Nintendo DS sequel of the popular Scribblenauts game. 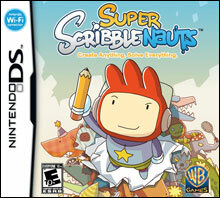 It was developed by 5th Cell and published by WB Games for the Nintendo DS platform - although it naturally still works with the Nintendo 3DS as well. One again you are put in charge of our little hero Maxwell as he faces stage after stage of strange puzzles with only tour magical pencil to aid him. In every stage you're faced with a new challenge such as competing in a race or finding a way to defeat a creature and ultimately retrieving the Starite in the stage. To do this, you type in keywords for whatever objects that you need and thus having them magically appear in the game. Beyond just nouns, this sequel allows you use various modifiers for the objects that you summon such as giving it a color, requiring it to be gigantic and the like. Gameplay is nicely diverse with the puzzle assortment and range being rather impressive. While some stages follow consistent patterns, on the whole you're not going to find yourself playing the same type of stage over and over again just yet! If anything though, I have to admit I wish there was a bit more of a continuous story going on, or perhaps more complex puzzles that require more than a relatively linear approach as evidenced in some of the puzzles. While there are a few of them that involve multiple steps, it still doesn't quite capture that sense of needing to keep on going or transitioning from one encounter to the next. Instead we have a series of isolated incidents and worlds where Maxwell does his thing and hopefully gets to resolve things. 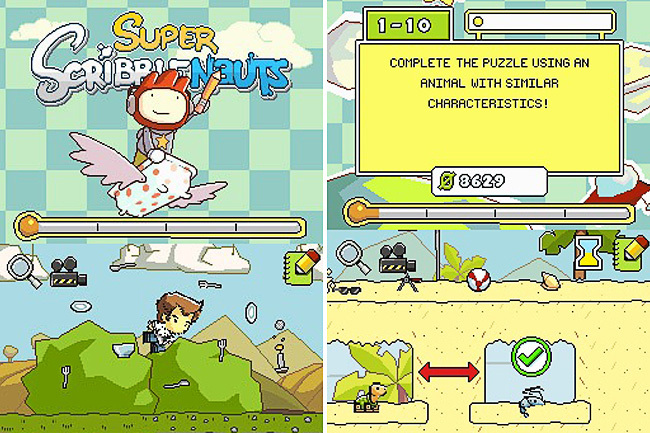 Still, Super Scribblenauts makes for a rather simple and yet fun game that is seemingly casual in nature until you realize that you've lost hours of upon hours of time after insisting to play "just one more stage". Thus the rates 4 giant dinosaurs that I keep on creating out of a possible 5. Yeah, I used to play this. I remember feeling overwhelmed about the availability of the items you need. Oh totally. The freedom to create just about anything can be both a pro and a con.